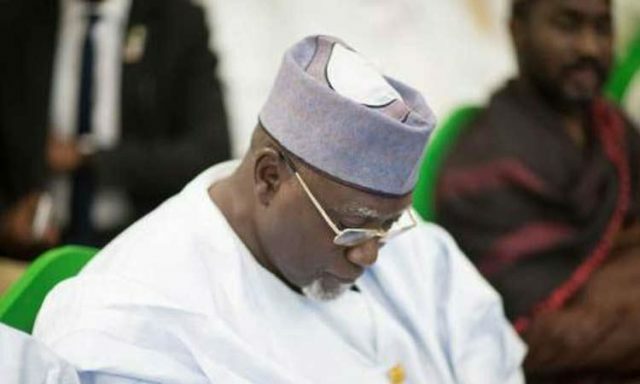 A former assistant to the sacked director general of State Security Service, Lawal Daura, has accused his former principal of extensive corruption, and has portrayed him as a man who serially betrayed his boss, President Muhammadu Buhari, for money. The assistant, Abdulwahab Abdulrahman, a retired senior SSS official, said he left the agency because of the scale of corruption and abuse there. “I didn’t want my children to see news of my eventual arrest on TV,” he told PREMIUM TIMES. Mr Daura, who led Nigeria’s domestic spy agency since 2015, was abruptly fired on Tuesday by Acting President Yemi Osinbajo after he ordered a siege on the National Assembly. 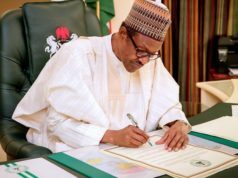 The siege, which many Nigerians have characterized as a coup d’état, startled a nation that has struggled in the past two weeks to keep pace with rapidly unfolding political stunts ahead of next year’s general elections. The cordon saw gun-wielding masked men blockading the federal parliament building in central Abuja, denying access to lawmakers and legislative staff. It was lifted several hours later, but only after Mr Daura was summoned by Mr Osinbajo and summarily dismissed. The acting president said the exercise did not receive authorisation. Many Nigerians believe the move was to facilitate the removal of Bukola Saraki as senate president as punishment for his leaving the ruling APC last week. But while such plot failed, it helped further galvanize public outrage against Mr Daura, a controversial figure who in the past three years managed to create for himself a notorious label as an outlawed official responsible for illegal detention, clampdown on dissent and disobedience of court orders. Now, his former associate, Mr Abdulrahman, whom some described as Mr Daura’s former “right-hand man”, has spoken out exclusively to PREMIUM TIMES on what he said was Mr Daura’s darker side Nigerians never knew. Mr Abdulrahman served as special assistant to Mr Daura until 2016. Besides corruption, he said Mr Daura repeatedly betrayed President Buhari. Messrs Abdulrahman and Daura were members of the Buhari campaign’s security committee in the buildup to 2015 election. The committee was led by the current Minister of Interior, Abdulrahman Dambazau. Mr Abdulrahman said he served as the secretary of the 25-member committee. PREMIUM TIMES could not independently verify the claim. Mr Daura could not also be reached as he remained in detention Wednesday. Some of his aides told PREMIUM TIMES Mr Abdulrahaman was bitter after being sacked by Mr Daura, and cautioned his claims be treated with restraint. Mr Abdulrahman denied being sacked; he told this newspaper he left of his own volition. But while several other sources in the security agency confirmed most of the allegations against Mr Daura, they told PREMIUM TIMES both men worked together for years either for good or for bad till they parted ways in 2016. Still, they said the revelations, especially with Mr Abdulrahman waiving any claim to anonymity, provide a rare opportunity for Nigerians to get a glimpse of the illicit practices at a security agency that should be one of the nation’s most revered, and how corruption and partisanship have stunted the department’s potential. Mr Abdulrahman said in the course of their work and as part of the transition team after Mr Buhari won the election, Mr Daura “kept producing fake reports about (Ita) Ekpenyong (his predecessor), but we never knew what he was targeting,” until late. He said Mr Daura soon developed the habit of going to Mr Buhari’s influential cousin, Mamman Daura, to report Mr Ekpenyong and give details of what the election committee was doing. That way, he said Lawal Daura warmed his way into Mamman Daura’s heart. He also said despite coming from the same neighbourhood in Katsina state, Mr Buhari never knew Lawal Daura until 2015. “He was introduced to the president by the late Senator Mustapha Bukar,” he said. He also said Mr Daura was never a favourite of President Buhari because of his “antecedents”, suggesting he was somehow imposed on him by Mamman Daura and others close to him. “When he was appointed he kept putting pressure on me and Maikano, the current AO (admin officer) at the presidential villa to come and work with him as SA. He assured me that what I will get under him, I cannot get even as a Minister,” Mr Abdulrahman said. Mr Maikano could not be reached to comment on the claim. Mr Abdulrahman said Mr Daura feared the DG job may not be very easy since he had never worked at the headquarters and was not an operational staff. “He said he wants the two of us to stabilise the service for him,” he quoted Mr Daura as saying. Mr Abdulrahman said he eventually agreed the offer after much pressure. He claimed as the work commenced, “Daura was receiving money from everyone including the president’s enemies”. Mr Abdulrahman said when they resumed, they always closed late at work, often at about 2am. “What are we doing was mostly: receiving Ghana must go filled with cash brought by enemies of government to him,” he said somewhat confirming he was part of whatever happened at the time. “The rate of corruption on that fourth floor was too much and the president doesn’t deserve this,” he said. “He will go and get information on plans for (Senate president) Bukola (Saraki) and then leak it to him,” he said. Similar allegation emerged Tuesday after Mr Daura’s removal, with many administration supporters accusing him of working for Mr Saraki against the government. On Wednesday, Mr Saraki said claims he compromised Mr Daura in respect of the National Assembly siege constituted an “insult on the intelligence of Nigerians”. But the two institutions under Messrs. Saraki and Daura clearly enjoyed cooperation in the past. In the heated days of the National Assembly’s standoff with the executive over the appointment of Ibrahim Magu as head of the Economic and Financial Crimes Commission, it was mostly memos from the SSS that the lawmakers referenced as basis for rejecting Mr Magu. At the SSS, Mr Abdulrahman said Mr Daura operated an repressive administration that stamped on staff rights just as it did on Nigerians’. In all, he said the scale of corruption at the agency was shocking. Such revelations, PREMIUM TIMES learnt, have already sent ripples across the agency and its sister organisations, with senior officials shuddering at the prospect of investigations after Mr Daura’s dismissal. In the course of his interview with PREMIUM TIMES, Mr Abdulrahman received multiple phone calls apparently from people appealing he should not yet go public. “I’m sorry sir, I will speak,” he told one caller. Mr Abdulrahman told this newspaper that at some point agents working for Mr Daura stopped going to the bureau de change to carry out transactions on his behalf. Rather, “they invite the secretary of the bureau de change at that Sheraton (Hotel) gate to come to the office late at night with their counting machines, counting dollars”, he said. “When I had too much I decided to leave and I swore to the directors who wanted me to stay because of their personal interest that Daura will leave office in handcuffs because of what I saw. “I was preaching to him that he needs to help Mr President because you know you don’t deserve this office and he appointed you, because of that he stopped my pension for two years until I threaten to go to court,” he said. On Mr Daura’s career history, Mr Abdulrahman said the former DG was sacked from the SSS originally before his reappointment by Mr Buhari because he was caught siphoning diesel from the SSS Academy in Kaduna. “Before then, he was almost sacked when he was State Director in Lagos. Tinubu, who was governor donated 20 vehicles to aid the work of the service in the state; Fashola, who is Minister now, was the Chief of Staff at the time, Lawal Daura took all the vehicles to Kano and sold them off,” he claimed. He also said Mr Daura had to be secretly taken away in Edo state because of how he was misusing staff stipends. “Just like today, how they had to use the back door to ferry him away, don’t you wonder why he was not taken back to the service facility? He wouldn’t have survived it. I have been receiving calls all day from some of our top directors and staff, everyone is in a joyous mood today. “In fact a director told me that all his life, he never drank beer, but today, he will drink to celebrate how this service is finally saved from destruction,” he said. This newspaper did not also independently verify those claims. Mr Abdulrahman also said Mr Daura was too arrogant as DG of SSS. 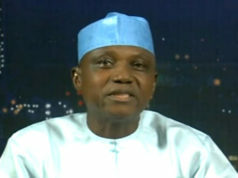 He said he had no respect for the National Security Adviser, Babagana Monguno, whom he should be reporting to. He also said he never had any respect for the vice president, Mr Osinbajo. “Whenever the Vice President calls for a meeting for 2 o’clock Daura will come by 3 and will not apologies. There was a time they had serious shouting match with Magu over the disrespect shown to the VP and the VP had to ask Magu to keep quiet,” he said. “Magu is a smart officer and he knew Daura wanted to use such information to extract money from people. He told Daura to his face that I can’t report to you, I only report to the president who appointed me,” he said. Mr Magu could not be reached Wednesday for comments. The former SSS official recalled an interesting conversation between a former NSA Sambo Dasuki (who is still in SSS captivity despite court orders) and Mr Daura. “Sambo Dasuki told Daura to be careful with this world,” he said, adding, “’I was one of the most powerful NSA, see me today. If you are not careful, you may replace me in this room one day’”.